Home » History » Historical Maps! Like old maps? We sure do! Here are six maps we have found of the land that is now the park, from 1683 to 1909. The historical locations play a role in a Ghost Story and Witch Story that take place in Glen Providence Park. Click on the images for a larger view! 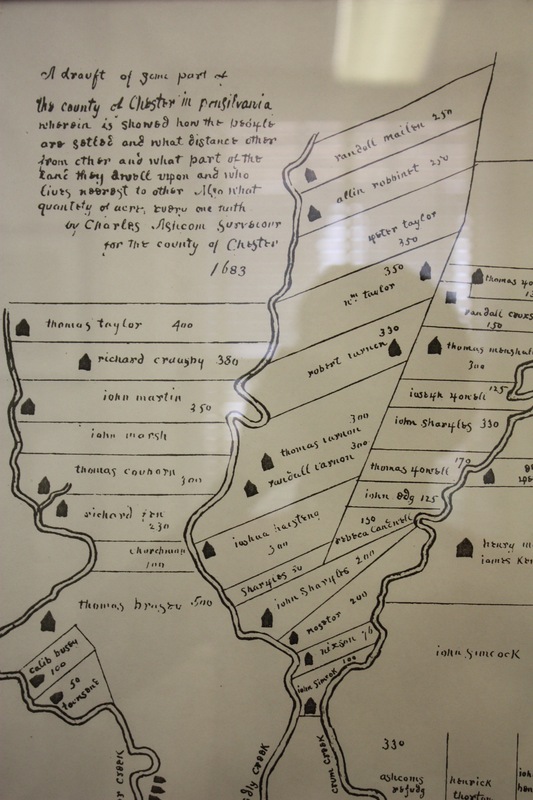 This is before Delaware County was created! That’s Ridley Creek in the center, with Crum to the right, and Chester to the left. The park would be just north of the center, to the right of Ridley Creek, on the land owned by Peter and William Taylor. Not coincidentally, 1683 was the year that land in this area was ceded by Native American tribes. That’s Ridley Creek up the center, along the orange boundary line. 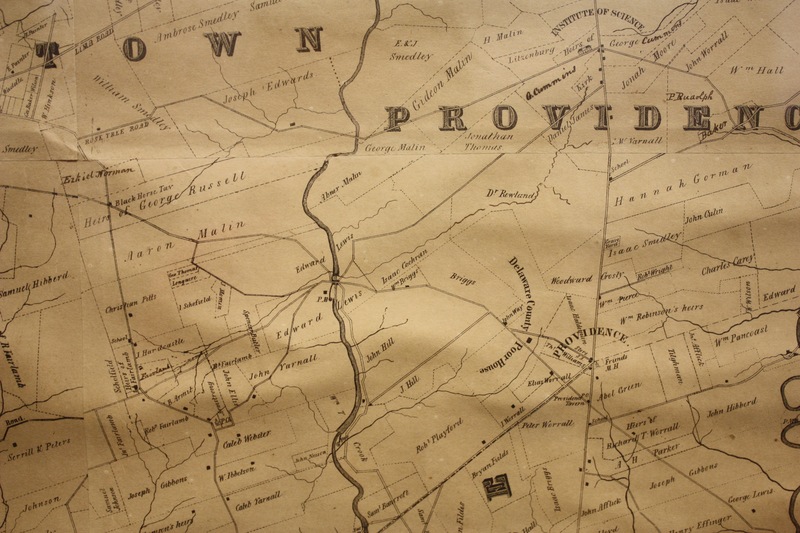 Broomall’s Run is along the word “Providence” in Upper Providence. The park would be under the “PR”. The road along the top of “Providence” is Kirk Lane- it was a major road at the time. There is no Ridley Creek Road shown. The park is just about in the center- the creek running along Isaac Cochran’s property is Broomall’s Run, and the road above that is Kirk Lane. Broomall’s Run is along the Borough line at the top. When Broomall’s Run was used as the Borough’s water supply, there was a reservoir and waterworks near Orange Street, upstream from the future Broomall’s Lake and Glen Providence Park. The orientation is tilted- note the compass rose. 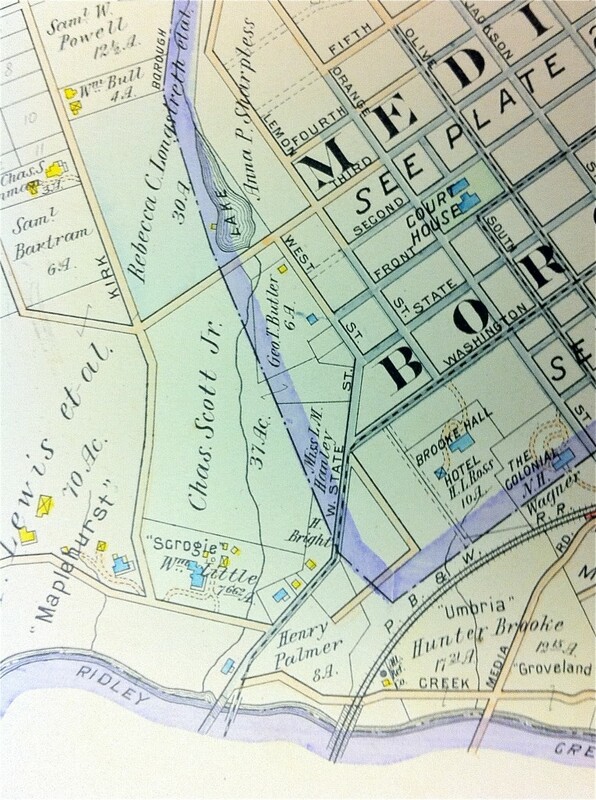 This shows Broomall’s Lake, which was created around 1883 by Judge John M. Broomall to harvest ice. It also shows Third Street crossing the dam. There is no park pond shown on this map- the pond was created in 1936 or 1937, after Glen Providence Park was established in 1935. What a find! This map shows the “Scrogie” estate (usually spelled Scroggie) which gave Scroggie Valley its name. 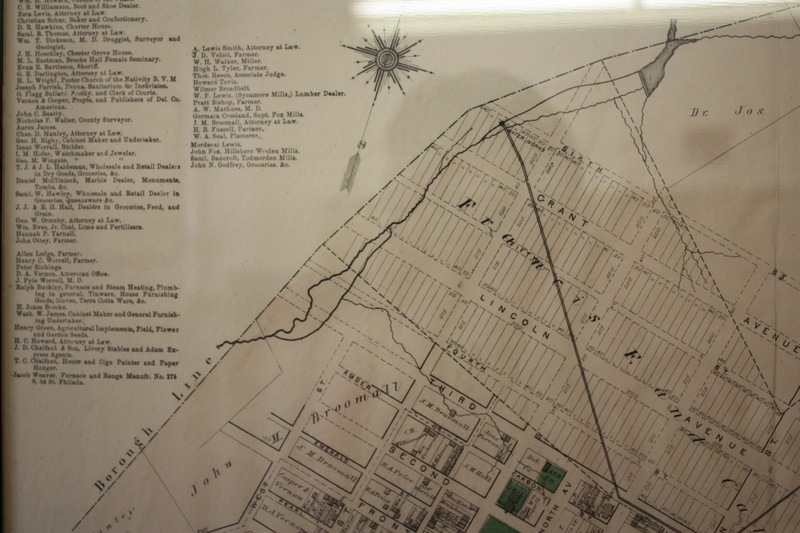 It also shows the Palmer family property where T. Chalkley Palmer grew up, and George Butler owning the “Broomall House” at Front and West Streets. George Butler must have later acquired the land he subsequently donated to create Glen Providence Park. The 1909 map from the “Property Atlas of Delaware County East of Ridley Creek” is posted with permission of the Media Historic Archives. 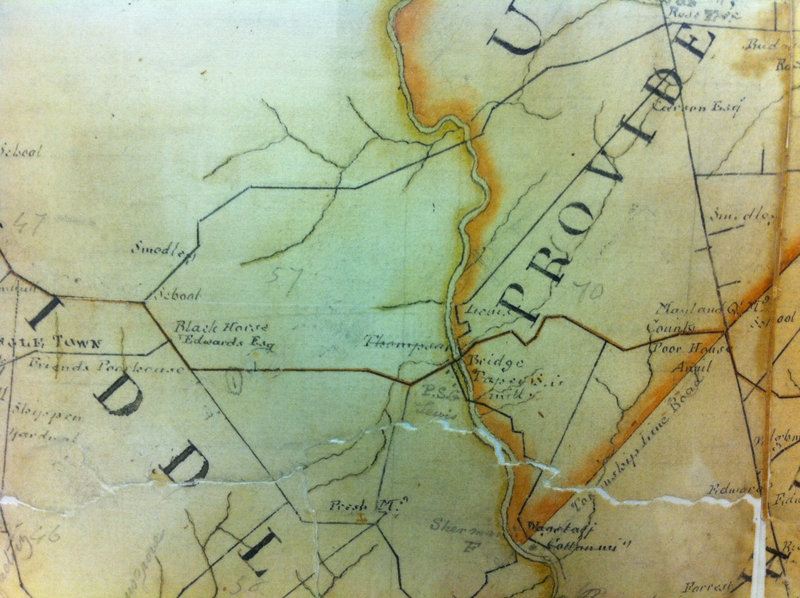 The 1683, 1810, 1848 and 1870 maps are posted with permission of the Delaware County Institute of Science. Check them out for yourself- they’re hanging on the wall in their map room! 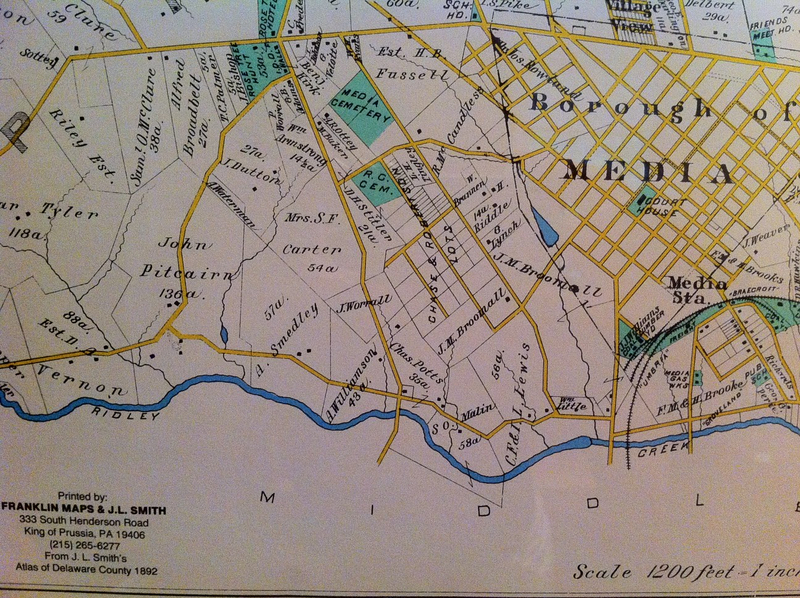 The 1892 map is on our own wall! We will add more historical maps as we find them! This is a fabulous website. I have already signed the petition. If it is useful to have more information about the Butler family,I have pasted in a short bio on the daughter of George and Eleanor, who lived on Kirk Lane in a house adjoining the park in her later life. Her children Ellie Reed Lewis and Clifford B. Lewis, must be contactable and might like to know about the Friends of Glen Providence Park. I wonder if anyone can find them. Dr. Mary Butler, (Mrs. Clifford Lewis III) (1904 -1970),was a noted archaeologist who specialized in Mayan ceramics of Guatemala, and Native American archaeology of the Hudson Valley and Western Pennsylvania. She was a graduate of Vassar College and Radcliffe College, after study at the Sorbonne, eventually earning a PHD at University of Pennsylvania. She was a research assistant of the American section of the Penn Museum for 30 years during which time she worked in Piedras Negras, later Alta Verapaz and Quiche, Guatemala. In 1939 she became director of the Hudson Valley Archaeological Survey. Thank you Sophie, that is so interesting! I heard that one of the Butlers’ grandchildren lives in Colorado. It is a great idea to try to contact her and let her know how much we love the park her grandparents donated! Hi Cliff, How wonderful to hear from you! I hope you can tell from our website how much we care about Glen Providence Park, and how appreciative we are of your grandparents’ gift of this land back in 1935. We would love to hear any stories or recollections you have about the park, or to answer any questions you have about it today. We are working to gather as much of the history of the park as we can, to guide us as we help to restore and care for the park. It is a truly special place. Sorry about the long silence. I have been engaged elsewhere, and also trying to remember where the memorial spring is (was) for my grand mother. Even in the late 60;s, the spring was pretty dry, and the memorial plaque was hard to find. I seem to remember it was on the south side, west of the lake center, and near some sort of bridge in the path. I have not been to the park in more years than I want to count, but may be able to get there some Wed in the next six months. We Babysit our granddaughter in St Davids on Wed, thus that day I am reasonably nearby. dam, and marveling, as a young lad of 8 or so, at the enormous height of the dam at the west end. I also remember teterring my way across the single plank bridge to the island. What is there now? You have probably read the document that granted the property to the Borough. I have never seen it myself, no great interest than or now, but I believe there was an interesting line in there that stated that as long as a Butler relative held land adjacent to the park, that family would have a say in the operation of the park. In about 1999, my dad finally sold that last parcel we still owned at Kirk Lane. My sister was upset that our relationship with the Park had ended. I am pleased that we have reconnected. The idea of removing the Bromall Lake dam sounds like the best option, especially as the lake is as shallow and unused as reported. Yes, your grandmother’s memorial waterfall is still there, on the west side of the pond. It is near the pond’s island, which now has a log to cross to get to it. Even though it is dry, the waterfall is still beautiful with ferns growing from the stone wall. It is our understanding that the 500′ pipe, which ran from the springs by the 3rd Street Dam to feed the waterfall, caved in over time. We are contemplating ways to restore the waterfall, or at least preserve its beauty. I have seen the park document, and I had wondered if any Butler still owned land surrounding the park. That it is interesting to hear that parcel was sold as recently as 1999! We agree that removal of the 3rd Street Dam seems like the best option- our most recent website posting is about stream restoration. We think it would be beautiful. Please let us know when you are thinking about visiting the park- we would love to meet you! It will be wonderful to meet you whenever you can visit! A year and half is not bad. Really, I must apologize for this long silence. Life has been very busy, and we haven’t had the opportunity to come to Media from St Davids. Actually, we live in Yardley, even further away. Finally back. Will be in St David’s area probably through the weekend; night sitting granddaughter while her mother recovers from bringing her sister in last night. Very pleased to see recognition for the waterfall, and the Park itself. I left a message here yesterday, but it seems to have disappeared. If you’d like to leave a personal note for Stephanie and be sure she gets it, try emailing friendsoftheglenATgmail.com. Take good care and congratulations on the new granddaughter! It is wonderful to hear from you, and to hear that you may visit the park! We would love to meet you at the park- you can always email me to let me know when that would be, as Shannon indicated.